Who Wins and Who Loses in a Government Shutdown? State lawmakers are expected to meet this week to consider a temporary, one-month budget in an effort to stave off the devastating effects of a government shutdown. But as the budget stalemate between Gov. Bruce Rauner and the Democrat-controlled General Assembly continues with no clear resolution in sight, who wins and who loses? We’ll hear from Chicago Tribune columnist Eric Zorn, Reboot Illinois' Madeleine Doubek, and WBEZ reporter Tony Arnold. 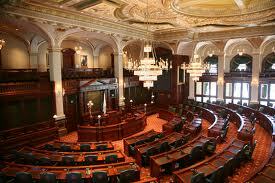 On Wednesday, July 1, the Illinois Senate passed a one-month temporary budget by a vote of 37-0. View an interactive graphic of how each senator voted. On Wednesday, July 1, the Illinois House of Representatives failed to pass a one-month temporary budget by a vote of 67-32. View an interactive graphic of how each representative voted. Video: How long will the game of political chicken over the budget continue?